With the hubbub on the softened property market, not even Penang, especially Penang Island, known for its land scarcity and extravagant property prices, is spared. However, in this snail-paced growth, what can Penang offer to homebuyers and investors? According to data from the National Property Information Centre (Napic), as at 3Q2016, the overall volume of transactions had declined 13.4% y-o-y with 4,382 transactions recorded in 3Q2016 as opposed to 5,060 transactions a year earlier. Total value of transactions in Penang had also dropped accordingly by 10.1% y-o-y to RM2,152 million compared to RM2,393 million in 3Q2015. Executive director of PPC International Penang Sdn Bhd Mark Saw says the cooling measures introduced by the federal and state governments have affected Penang’s property market performance over the past three years, as evident from Napic’s data. Executive director of PA International Property Consultants (Penang) Sdn Bhd Michael Loo concurs that the property market in 2016 had further consolidated with the overall sales activity on a downtrend since 2015. “It could be due to various reasons such as the strict loan approvals for end-financing, and the cautious sentiments over the economic slowdown which have prompted developers to defer their launches and push back plans for development,” says Loo. When will the market recover? Executive director of Landserve Penang Sdn Bhd, Ooi Choon Seong does not foresee a recovery this year, but expects no price reduction overall due to the rising cost in building materials and land for new property launches. On the other hand, Saw is more optimistic. “Based on historical property cycles, we can anticipate that the market has stabilised and an upward swing is expected in due course for the second half of 2017,” he says. Indeed, the real estate consultants think this is a good time to go bargain-hunting. Loo, for instance, points out that some property owners who are facing liquidity problems may be prepared to cash out at low prices. “With fewer buyers, sellers may be more willing to compromise. A price adjustment between 5% and 10% is expected. Price correction is a healthy development in a property cycle when prices have reached the peak,” Loo opines. While the landed housing market on Penang Island has slowed with prices facing a correction, there are housing areas that are faring better than others. Based on data collated by TheEdgeProperty.com, the terraced housing projects or areas on Penang Island with the highest compound annual growth rate (CAGR) between 4Q2012 and 3Q2016 based on their average transacted prices were Sunway Aspera, Teluk Kumbar Heights, Island Park, Taman Saw Kit and Bayan Baru with a CAGR of 17%, 16%, 15%, 14% and 12%, respectively. Meanwhile on Penang mainland, the highest CAGR was recorded at Taman Murai Jaya, Taman Keenways, Taman Mangga and Taman Impian Murni with a CAGR of 37%, 29%, 28% and 27%, respectively, mainly due to their low entry levels. Sunway Aspera and Teluk Kumbar Heights with a CAGR of 17% and 16% respectively are both located in Teluk Kumbar. Teluk Kumbar is located at the south west district which is popular with homebuyers as it is located near the Second Bridge or Jambatan Sultan Abdul Halim Muadzam Shah. It is also near the Penang International Airport, thus offering easy accessibility, especially for frequent travellers between the mainland and the island, says Saw. “While two-storey terraced houses at the Bayan Baru area [located next to Bayan Lepas], with a land area of 1,200 sq ft to 1,300 sq ft, have asking prices of RM900,000 to RM1 million, similar houses in Teluk Kumbar are still available for less than RM800,000,” says Ooi. According to Landserve’s transaction data, in 2016, a unit at Sunway Aspera with a land area of 1,302 sq ft was transacted for RM778,000. However, based on TheEdgeProperty.com’s data, Sunway Aspera’s average transacted prices have already breached the RM1 million mark. In 4Q2012, the average transacted price of Sunway Aspera terraced houses was RM627,275 while in 3Q2016, the average transacted price has shot up to RM1.17 million. Over at Teluk Kumbar Heights, the average transacted price for terraced homes was RM560,000 and this rose to RM998,000 in 3Q2016. “With just 5 to 10 minutes of travelling time [to Bayan Lepas from Teluk Kumbar], the pricing appeals to homebuyers,” explains Landserve’s Ooi. He also notes that the ongoing upgrade of a one-lane road from Jalan Teluk Kumbar to Jalan Bayan Lepas into a two-lane road will further improve connectivity once it is completed in 2018. Also in the south west district is the Bayan Lepas/Bayan Baru area, a mature area with many amenities such as the Penang International Airport, factories (Bayan Lepas Free Industrial Zone), commercial areas and the new Subterranean Penang International Convention and Exhibition Centre SPICE (formerly known as PISA). “These have influenced the demand for properties there. Moreover, as most are landed properties, the demand will always be there, hence prices will continue to increase in the Bayan Baru area,” Saw notes. Ooi concurs, adding that the Bayan Lepas Industrial Zone houses many MNC factories with large workforces. According to the TheEdgeProperty.com’s data, the average transacted price of terraced homes in Bayan Baru was RM405,000 in 4Q2012 while in 3Q2016, they were transacted at an average price of RM639,333. Island Park, Jalan Besi which is in the Greenlane area and which recorded a CAGR of 15% is located near several prominent schools such as Chung Ling High School, Penang Free School and Han Chiang High School, making the area attractive to families with school-going children, offers Ooi. “In 2015, there were 2-storey terraced houses there with a land area size of 1,400 sq ft to 1,800 sq ft which were transacted at RM998,000 to RM1.3 million,” he says. TheEdgeProperty.com’s data shows the average transacted price of terraced houses here was RM943,333 in 4Q2012 and this has jumped to RM1.63 million in 3Q2016. An old housing estate which has seen recent price growth is Taman Saw Kit (CAGR 14%), in Sungai Nibong. Ooi notes that the project’s main draws are its connectivity and accessibility. “Taman Saw Kit is over 30 years old. It is highly accessible from Jalan Sultan Ahmad Shah which leads to the town area and the coastal roads. It is also about 10 minutes away from Queensbay Mall, so pretty much everything is taken care of,” Ooi adds. Based on Landserve’s transactions, three 2-storey terraced houses here with a land size of between 1,400 sq ft and 1,500 sq ft fetched between RM960,000 and RM1.2 million in 2015. The average transacted price according to TheEdgeProperty.com, has risen significantly from RM620,000 in 4Q2012 to RM1.05 million in 3Q2016. 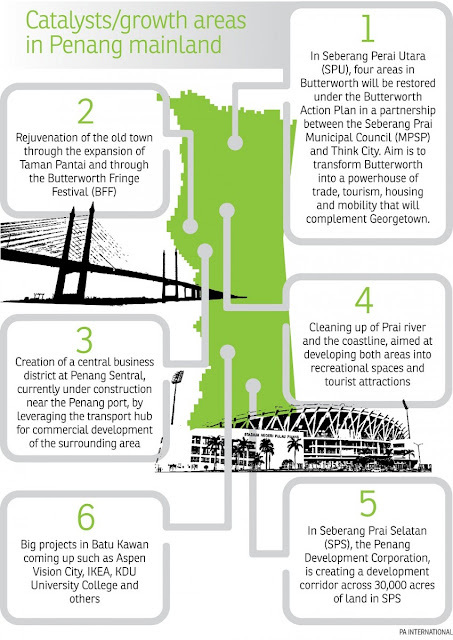 “Penang has many areas for future growth, especially on the mainland. Batu Kawan is definitely one of them. Seberang Prai Utara and Tasek Gelugor have also attracted interest and we look forward to seeing how these areas will develop,” offers Saw. The recent announcement of Boustead Holdings Bhd selling its Malakoff estate to S P Setia for RM8.50 psf or over RM370,000 per acre augurs well for this area, he adds. The connectivity between the island and mainland is expected to be enhanced with the proposed Light Rail Transit (LRT), Penang Undersea Tunnel and cross-channel cable car. “The Bayan Lepas LRT alignment project and Pan Island Link highway were determined as the first components in the delivery sequence of the Penang Transport Master Plan. We think the first phase of the LRT line should include the Georgetown to Butterworth line as this will definitely enhance connectivity and balance up the development between Penang Island and the mainland. We believe they can be linked the way Hong Kong and Kowloon are linked,” Loo of PA International says, adding that public transport is crucial on the island to ensure the liveability of the city. By his estimate, the transaction volume of landed houses in Penang has dropped by 20%, when comparing the January to September periods of 2015 and 2016. Comparing those two periods, he also notes that the 2 and 2.5-storey semi-detached houses on the mainland are the only types of landed houses that saw higher sales in terms of volume albeit slightly (2%). Meanwhile, Saw notes that the demand for terraced homes on Penang Island is now lower than the demand on the mainland. “It happens as properties on the island become increasingly expensive. Nevertheless, despite the shift in focus to the mainland in the last few years, the landed housing market on the island remains firm as new supply is limited coupled with pull factors such as good job opportunities and the improvement in infrastructure on the island,” he says. Housing affordability on Penang Island has been a concern for many years and the state government has increased the development plot ratio to encourage affordable housing projects. Land reclamation and redevelopment projects of high-rises may also help alleviate the issue. “In recent years, Penang has seen a move towards reclamation of land. This new supply of land and better planned developments will translate into more efficient products and eco-friendly buildings. With higher density developments, developers can, through economy of scale, produce less expensive properties and more affordable housing,” Saw says. Meanwhile, Loo suggests that transforming the mainland into a vibrant city can encourage Penangites to choose the mainland as their home. This in turn could help soften the property prices on Penang Island. While short-term challenges remain for current investors until the property market stabilises and improves, Penang Island will continue to attract investors from near and far in the long term. “It has that tropical island appeal, while offering world-class medical care combined with a relatively low cost of living and a whole host of gourmet choices, plus good education facilities for those with young families,” says Saw.